I was glad to receive Canada’s first Influenster Maple VoxBox. This is my second voxbox and I can’t complain about receiving free products to try! – This mascara appears to add curl and volume to your lashes–who wouldn’t love that? I love the colour and packaging of this, but sadly I do not think I will be trying it out. I have way too many sample mascaras to still try from other beauty boxes and plus, this one is not waterproof which is my preference. – A lipgloss is essential in any woman’s purse. This colour is very pretty! A pale pink colour that would go well with any skin tone. This one in particular is supposed to add a plumping effect to your lips, we shall see if it works! 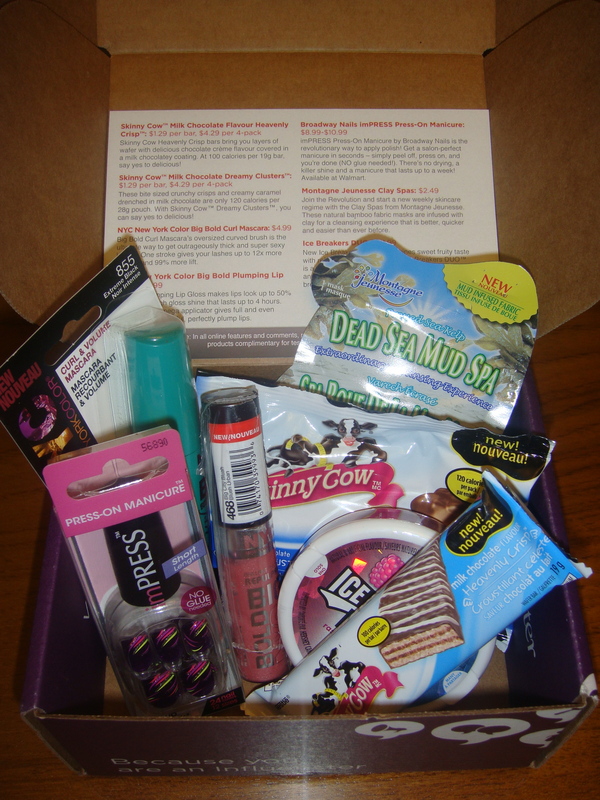 – I have previously received these in my first VoxBox I received this past spring. These nails are as easy as 1, 2, 3 because you simply just press these on to your actual nails. The design is nice, but I have never been a fan of artificial nails. I just may try these out for a special occasion though. – I have seen these masks around before, but have never decided to try it–now I can! I received the Dead Sea Mud Spa Mask which contains real mud, dead sea and sea kelp. Sounds lovely, eh? These masks are supposed to be easy to use and would make your skin feel refreshed and soft afterwards. – This is described as layers of wafer with chocolate creme flavour covered in a milk chocolate coating. I have already had a bite out of this, I couldn’t resist! It reminds me of a Kit Kat due to its crispy texture, but less sweet. – These clusters are described as bite size crunchy crisps and creamy caramel drenched in milk chocolate. Upon trying a bite, it has a creamy caramel center with crisps on the outside and tastes a just bit too sweet. The pieces itself are quite small and there are five clusters in this package. The portion sounds small, but if you take half a bite instead of just popping them in your mouth, it is quite satisfying. – These mints are two sided with a fruity flavoured, textured side and a minty, smooth side that freshens your breath. They have cooling crystals that are supposed to leave your mouth feeling refreshed anytime during the day. Also included were coupons for $1.00 off any two NYC New York Color Products. If you received a Maple Voxbox as well, what were your thoughts?